I got a new pair of shoes in the mail (yes, I really was wearing footie pajamas when they arrived) and maybe built an outfit around them last weekend. Sometimes shoes first is the way to go. Something about this outfit makes me feel cooler than I actually am. It's a laid back but still put together vibe that I so rarely manage to achieve. Of course, I tripped in front of lots of people walking home from dinner, so that took me down a notch. Just an average day in the life. I love those shoes!! 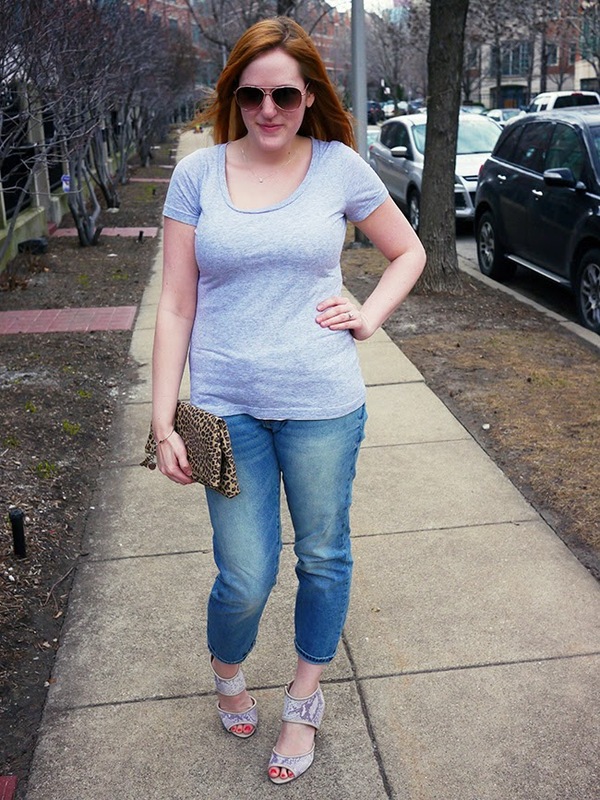 There is nothing better than jeans, a t-shirt, and cute heels! Love that clutch - so cute! OMgggg those shoes! Love this outfit!! Cool casual look! The bag and shoes are amazing! So gorgeous! I love how simple this look is but how seriously stunning you look. I gotta work on my casual glam looks! I LOVE THIS! I'm so drawn to outfits with basic pieces and a little bit of a twist - those fun shoes are so cool, and add such a statement to your outfit! Hahaha every time I feel cool I inevitably trip or do something else embarrassing as well. But this outfit is so great! Loving these shoes!